The Taj Mahal was built by the mughal emperor Shah Jahan in memory of his queen Arjuman-d-Bano Begum, entitled 'Mumtaz Mahal'. She died in 1631 and her body was enshrined in crypt of the main tomb. Shah Jahan, who died in 1666 was also buried there. 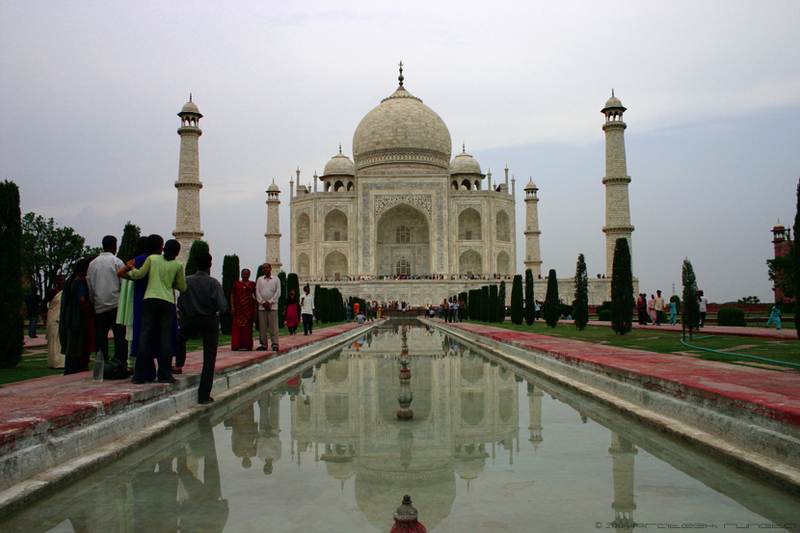 The Taj Mahal is a mausoleum of both Mumtaz Mahal and Shah Jahan. Originally styled as 'Rauza-i-Munavvara' and 'Rausza-i-Mumtaz Mahal', gradually it became famous as Taj Mahal and Taj-Bibi-ka-Rauza translating into the Garden-Tomb of the Taj Queen. It was completed in 1648 in 17 years, at the cost of about Rupees four crore (40 million) when gold was sold at R.15 per tola (11.66 grams). It was efficiently maintained by expert architects and engineers with the help of skilled masons, gardeners, and other workers, unitl it fell on bad days, in the 18th century A.D. its doors, loose fittings and furniture of ebony and sandalwood, costly lamps, stands, utensils, rugs, carpets, curtains and wall hangings of rare textiles, jewelled coverings - the entire paraphernalia was plundered successively by the Jats, the Marathas and the British of the East India Company who captured Agra in 1803. The British replaced the original gold kalash finjal in 1810 and, the Taj was once - during the regime of Willian Bentinck - put to auction only for the value of its marble. Fortunately this sacrilege was averted. The Taj survived, although in bare skeletal form without the Imperial coverings and due to the non-stop addition of pollutants into the air, the white marble has lost its original colour. Yet it is beautiful. Now if only people (going away for almost 3 days) did not leave cell phones with their mothers it would be so much better. Thanks for the history. It still remains a stunningly beautiful building. love the mirror image in the water..lovely shot.. Awesome pic rungta ! So total photographer these days ! Kool yaar ! I luv the TAJ yaar its like 100 thousand times better if you see it for real. And btw u got on my habit of leaving your cellphone kya ? Thankfully I haven't got your habit yet, its that stupid girl Niyati who's left her cellphone.